Fry the halloumi in a pan until cooked and golden brown, about three minutes on each side. 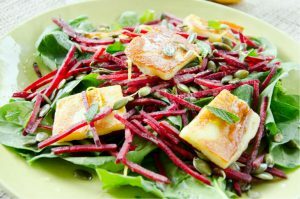 Put the lettuce in a mixing bowl, add the beetroot, pistachios, halloumi slices and peach slices. Mix the mustard, olive oil, red-wine vinegar and honey in a small bottle and shake the salad dressing well so that the vinegar and oil can mix. Pour the salad dressing over the salad and stir through well. Thjis salad will stay good for the rest of the day.